Bitcoin vs Bitcoin Cash: What’s the Difference? August 1st, 2017 marked the culmination of a bitter struggle for the heart of bitcoin. Although the argument over bitcoin’s block size limit had raged on for years, the situation came to a head, when bitcoin miners voted in favour of BIP (Bitcoin improvement protocol) 91 on July 20th. BIP 91 had been proposed by James Hillard and advocated for the adoption of Segregated Witness in the bitcoin blockchain. This caused a stir among some users, who believed that Segregated Witness (SegWit) was a step in the wrong direction for bitcoin. Instead, they proposed their own solution: Bitcoin Cash. This new cryptocurrency seemed to offer a solution to bitcoin’s scaling problem and also promised to stay true to Nakamoto’s original vision. By now, enough time has past to look at the main differences between Bitcoin and Bitcoin Cash. We’re also going to discuss whether Bitcoin Cash has been successful in its endeavor to provide a better alternative to Bitcoin. Below you will find a brief comparison of the key distinguishing features. To understand what Segregated Witness is and why it proved such a divisive topic among Bitcoin users, we have to understand the increasingly political and even philosophical meaning of the cryptocurrency. A large minority believe that Satoshi Nakamoto’s original intentions should be at the forefront of every decision regarding Bitcoin. In his white paper: Bitcoin: An Electronic Peer-to-Peer Cash System, Nakamoto clearly states that his intention is to provide a form of digital cash, which works independently of financial institutions. Indeed, that is where the name Bitcoin Cash derives from. But in order to fulfill that promise, Bitcoin needs to be able to handle thousands of transactions per second. At its current rate of only seven transactions per second, 1mb blocks fill up too quickly for mainstream adoption to be a real possibility. Segregated Witness is a soft fork which aims to temporarily tackle Bitcoin’s scalability problem and was enforced on the Bitcoin network from block 481,824 onwards. This change to the Bitcoin protocol frees up space in the block by splitting each transaction into two parts, removing the signature from the original portion and adding it separately to the end. This effectively doubles the space available for transactions to be stored in each block. For advocates of Bitcoin Cash, Segregated Witness is simply a way to “kick the can down the road.” It does not solve Bitcoin’s scalability problem, but instead just delays an inevitable hard fork. Indeed, even with Segregated Witness, Bitcoin is still miles away from achieving the 1,700 transactions Visa can currently process per second, a number which is more in tune with Nakamoto’s original vision of digital cash. A word you will come across repeatedly when reading about Bitcoin Cash, is “hard fork”. This term denotes an irreconcilable split with a blockchain, and is how Bitcoin Cash came about. To be more specific, think about the Bitcoin blockchain as abiding by certain rules. These rules determine key features of the Blockchain, such as how big the block size can be. In the case of Bitcoin Cash, a group of users who were unhappy with BIP 91, changed the rules of the Blockchain in order to increase the block size from 1mb to 8mb. Starting August 1st, miners sympathetic to the cause started mining these new, bigger blocks and Bitcoin Cash was born. This was Bitcoin’s first hard fork, and only one other has occurred: Bitcoin Gold. Although Bitcoin Cash has managed to establish itself as one of the largest cryptocurrencies in terms of market capitalization, it’s not all been plain sailing. In fact, on the 13th of November 2017, Bitcoin Cash activated a hard fork of its own. At the time of its split with Bitcoin, the developer team behind Bitcoin Cash had implemented a new difficulty algorithm which was meant to help it adjust back to normal more quickly. This change soon backfired, however, as it encouraged erratic mining behavior. Indeed, it regularly occurred that miners would operate at a loss, or blocks would take hours to be mined. 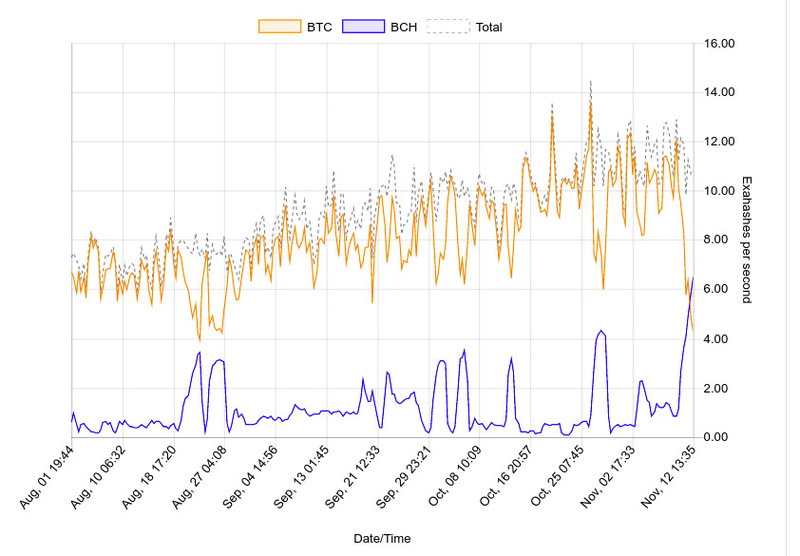 On the flipside, once the difficulty crashed, miners would flock to Bitcoin Cash, even causing the hashrate to temporarily overtake that of Bitcoin. Unpredictable mining behavior is dangerous for a number of reasons. Primarily it determines the cryptographic security of the blockchain. If miners periodically abandon a cryptocurrency like has been the case with Bitcoin Cash, the vulnerability of the blockchain increases exponentially. This opens the door to fraudsters and bad actors, who would delete or reverse transactions for personal gain. To tackle this issue, the Bitcoin ABC developer team proposed a hard fork, which would cause a recalibration of the mining difficulty every 600 seconds. Activating on the 13th of November, it has so far resulted in more stable mining behaviour and increased predictability of coin issuance. Bitcoin vs Bitcoin Cash – Who won? Bitcoin’s scalability has been a point of contention for years among bitcoin advocates. The hard fork which created Bitcoin Cash was the culmination of a dispute which could not be solved diplomatically. As is often the case, your answer to this question will vary depending on your perspective. From a technical point of view, it is clear that Bitcoin Cash has been a success. It has now mined over 28,000 blocks, and is able to process around 28 transactions per second. Transaction fees are also at a fraction of that of its older brother. On the flipside, the development of Bitcoin Cash has become more centralized than Nakamoto would have wanted. The Bitcoin ABC developer team has an inordinate amount of power over the cryptocurrency, and its future trajectory. Furthermore, the number of transactions remains relatively small, and the amount of active wallets is currently about 5% that of Bitcoin’s. Finally, the significantly reduced hashing power being expended by miners, means that the Bitcoin Cash blockchain is far more vulnerable than that of Bitcoin. That being said, I think Bitcoin Cash has managed to carve out a place for itself on the Mt Rushmore of cryptocurrency and is surely in it for the long hall. Chris Grundy is an avid tech enthusiast and the Head of Marketing at SelfKey. He's been writing about the Bitcoin space since 2015 and has enjoyed every minute of it.